I maintain a running mental list of "people whom I've never met, but who I'd buy as many rounds for as they'd let me, if I could just keep them talking where I could listen." One of the names on that list has been Jack Joseph Valenti, but he died yesterday of natural causes at age 85. He returned to Humble [after serving in World War II and earning a Harvard MBA,] and described his most notable work as the "clean bathroom" publicity campaign for the company. "Clean bathrooms," yuk yuk. But a couple of generations of Texans (and probably Americans from elsewhere) of a certain age (close to mine) might read that last sentence and immediately flash back to a cartoon character ("Handy Oiler," I think?) 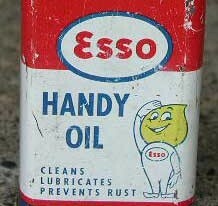 wearing a spotless Humble Oil Co. (or maybe Esso or Enco) uniform, with a dual caption reading "Happy Motoring!" and "Clean Inside!" Roughly a half-century has passed since that ad campaign, and yet for reasons historical rather than rational, I still prefer to pull over into an Exxon station when I find myself in need of a clean bathroom while on the road. Jack Valenti was famously associated with the movie industry, of course, but I suspect the most famous, and most telling, image of him personally was a still picture, reproduced below, in which he was hardly the center of attention on November 22, 1963. 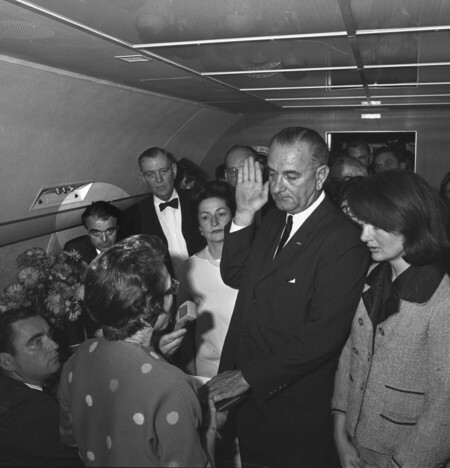 He was but one of many crammed into the main cabin of Air Force One as he watched his patron, Lyndon Johnson, taking the oath of office as the 36th President of the United States. Yet his face in this photo was a perfectly readable mask of fatigue and shock and pain. He was a famous, and famously effective, lobbyist, and he had the reputation of a raconteur and story-teller. I leave to others any debate about whether he was a force for good or evil, and whether he was, on balance and over a long life, a good man or a bad man. I simply would that I had had a chance to hear him tell his tales unvarnished and in person — for no better reason than because I am a curious student of history, and he was a man who was so often, as in that photograph, within arm's length of its making.